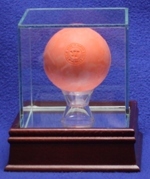 Single Lacrosse ball acrylic display case with black base. Features a custom t-cup ball stand. simply leave that field blank. Price includes 1 free nameplate. Engraving area is approx 4"x4"
you can display multiple cases together. 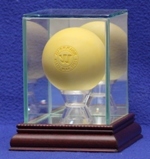 Acrylic single lacrosse ball display case with beveled edges and hard wood base with cherry finish. sized to hold a lacrosse ball. Includes 1 free nameplate.